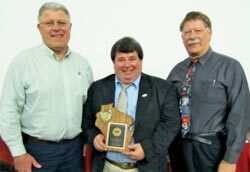 (L-R) Manitowoc County Airport Manager Chuck Behnke, Curt Drumm of Lakeshore Aviation, and Jeff Baum of Wisconsin Aviation and Vice President of WATA. Jim Wheeler were recently honored by the Federal Aviation Administration (FAA) for 50 years of flying safety and contributions made to general aviation. Read more. Gear Down on Final... or Not? 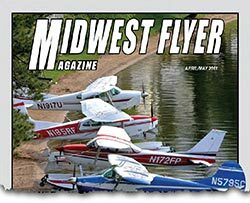 September, 2013 – If you have your seaplane rating, or are interested in learning about flying seaplanes, read this short, interesting article by our own Curt Drumm, written for Midwest Flyer Magazine. Curt's stories are always full of fascinating aviation tidbits and spiced with humor. This one will get your juices going to get into the cockpit of a seaplane! Read more. September, 2013 – The Manitowoc County Airport has received a couple of nice upgrades. 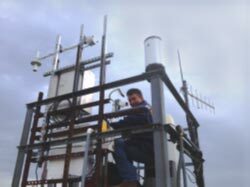 FAA technicians have completed the installation of a new AWOS weather system, bringing us the latest technology to improve weather observations along our lakeshore location with its “unique” climate. Most notable in the new system is the addition of a “present weather sensor” which will determine what kind of precipitation, if any, is falling from the sky. It will differentiate between rain, snow, sleet, freezing rain, etc. Another improvement coming soon will be the addition of a Terminal Area Forecast (TAF) unit. The National Weather Service has long wanted to have this for the shoreline communities of Manitowoc, Sturgeon Bay and Sheboygan. With Manitowoc right in the middle, it made sense to have it here. It will be especially useful to jet and air charter operators and give all of us a better interpretation of what’s really going on outside. The approach lighting system for runway 17 is also being upgraded. The FAA is removing the current VASI lights and replacing them with more precise PAPI lights. Construction began Sept. 12, 2013 and will take about three weeks to complete. June, 2013 – Lakeshore Aviation's new C90 King Air charter aircraft is the cover story with an in-depth, eight-page spread in the June issue of AOPA Pilot magazine. Read more. 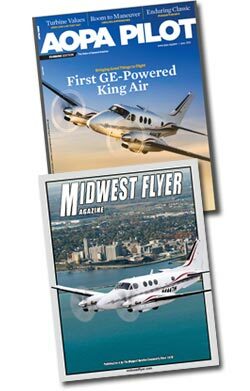 June-July, 2013 – The feature story and cover of the June-July issue of Midwest Flyer Magazine also featured our new King Air C90, the first in the country powered by GE's new H80 turboprop engines, and now approved for FAA 135 Air Charter service. Read more. 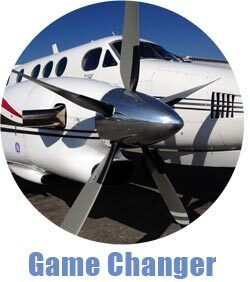 March 25, 2013 – The newest addition to the Lakeshore Aviation charter fleet, an impeccably-restored King Air C90, is the first aircraft in the world to feature fuel-efficient GE H80 800 HP engines- and it’s already being seen as a potential game-changer. “This is GE’s first engine being used on business turboprop aircraft, and the improvements it brings to the turboprop flying experience are incredible,” said Curt Drumm, Lakeshore Aviation President and a commercial/instrument-rated pilot who also serves as the organization’s charter captain. “We’re seeing faster speeds yet we’re burning less fuel. The extended service life of 3,600 flight hours or 6,600 cycles between overhauls will result in a significant reduction in maintenance costs.” Read more. Lakeshore Aviation is pleased to announce our expanded Air Charter fleet, giving you more options for your personal and business travel needs. We just expanded our fleet to include a newly restored King Air C90 business Turboprop airplane, with seating for up to 7 passengers. It is the first aircraft in the world that features fast, fuel-efficient GE H80 800 HP engines. These engines, built in the Czech Republic, evolved from an engine with a history of over 17 million flight hours, mostly with Eastern European airlines. They’re rugged and tough with a proven history, perfect for reliable transportation. The plane flies at nearly 300 MPH, high above the weather. It has brand new paint and leather interior, and the latest in glass panel color GPS technology for your comfort and safety. 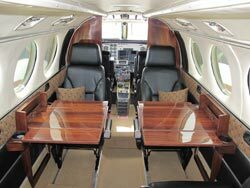 In addition, we also recently added a beautiful Cessna 340A pressurized business class twin-engine airplane.. With stunning new paint and beautiful leather seating for up to 5 passengers, you can travel in style for up to 4 hours at nearly 250 MPH. Call us for more information. 2012 Small Business of the Year Award! Aviation Business of the Year Award Winner! 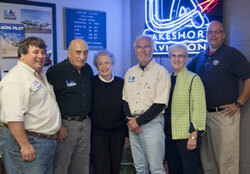 Lakeshore Aviation was awarded the 2011 Aviation Business of the Year by the Wisconsin Aviation Trades Association. We now share that honor with some of the most prestigious and well-run aviation companies in the state, and are truly honored to be in such good company. Stop in an visit us. You'll find some of the best service around, smiling faces and competitively priced fuel. We're Expanding our Operation again! 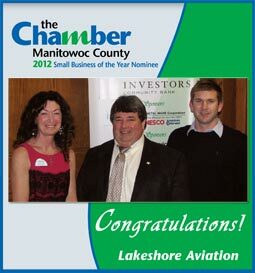 Lakeshore Aviation and Manitowoc County Airport are investing in your future! 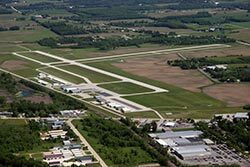 In the past 4 years, Lakeshore Aviation expanded from 1 hangar and 8000 square feet to 3 hangars, with over 24,000 square feet of space. We just completed a construction project again, doubling the size of the hangar we built 2 years ago. Jet A and high-octane-ethanol-free Mogas for LSA and STC'd aircraft. Of course, full service 100LL and Jet-A are still available from our courteous staff, too.